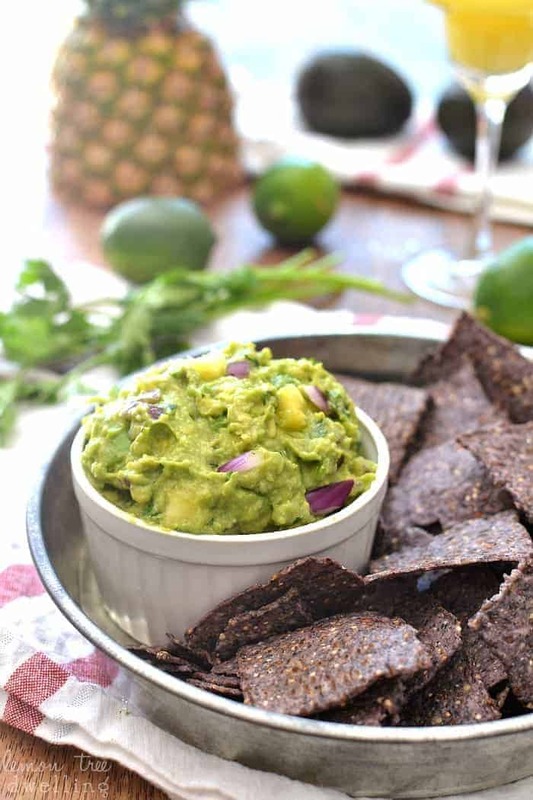 The BEST guacamole recipe with a delicious twist of pineapple! The perfect recipe for Mexican night, summer BBQ’s, or Cinco de Mayo! Just be sure to make a lot….it goes quickly! Mexican food – we love it! We probably eat it as a family at least once a week, and when it comes to eating out, it’s hands down our favorite! We love the baskets upon baskets of fresh, warm tortilla chips; we love (and eat way too much of) the delicious homemade salsa, we love the fun, family-friendly atmosphere, and we love the fact that we never have to wait too long for our food! As for drinks? Well, it’s clearly all about the margaritas! We typically go frozen strawberry….although I must say, between that and the regular on the rocks, it’s a tough call! The good news, I guess, is that you really can’t go wrong. From the food to the drinks to the fast service and fun atmosphere, Mexican is where it’s at! BUT……. You knew there was a but, right?? The thing about Mexican is that it’s way too easy to eat way too much of it! And there’s no better way to ruin your love for something than by over-indulging. Speaking of over-indulging, do you have a thing for guacamole like I do? It’s just SO good! Almost too good, if you ask me…..especially when you add a fun twist like pineapple! Deliciously dangerous. Dangerously delicious. As Mexican food tends to be! In a medium bowl, combine minced jalapeno, kosher salt, lime juice, cilantro, and onion. Love Mexican and a yummy guacamole! This looks so yummy, I love the addition of pineapple, refreshing and different!!!! So good – count me in! 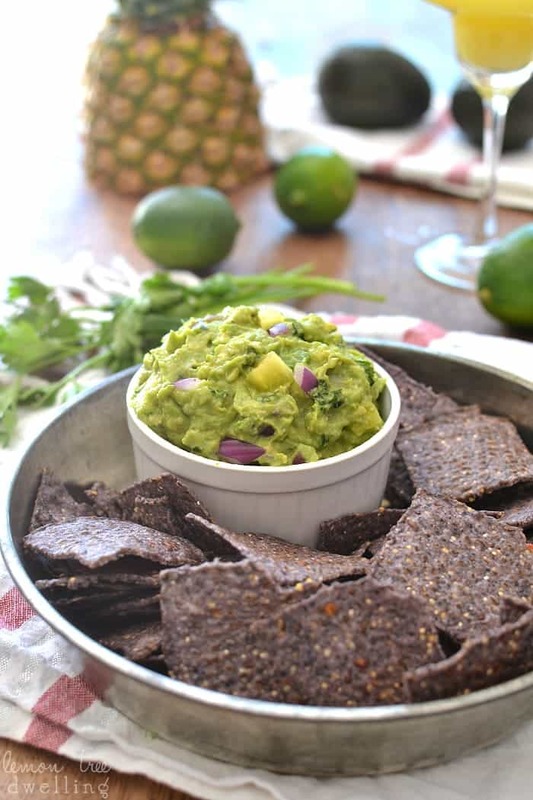 I could totally live on fresh, warm chips and fresh guac. This sounds awesome, I’m totally digging the pineapple in there. Oh, and margs too, of course. Yum! I always go for strawberry margaritas too. We love mexican food. 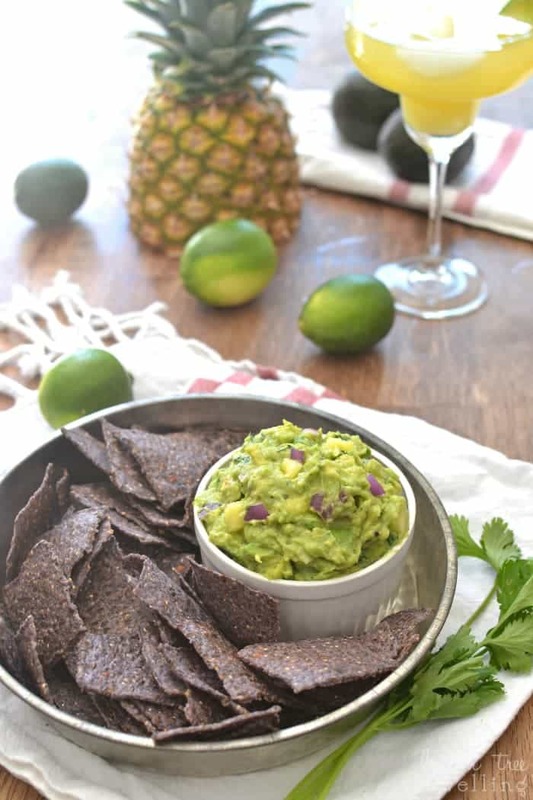 This pineapple guac looks delish. I seriously could eat the whole bowl alone! Ahh, margaritas and guacamole! Taste bud bliss 😉 This recipe looks fantastic! Pinned! Thanks for sharing!! Pineapple Guac!?!?! I’m intrigued. I’m going to have to try this one for sure. You are SOOOO speaking my language here. This looks incredible. And I am totally in love with the styling in these photos. Adorable! We love Mexican food too! 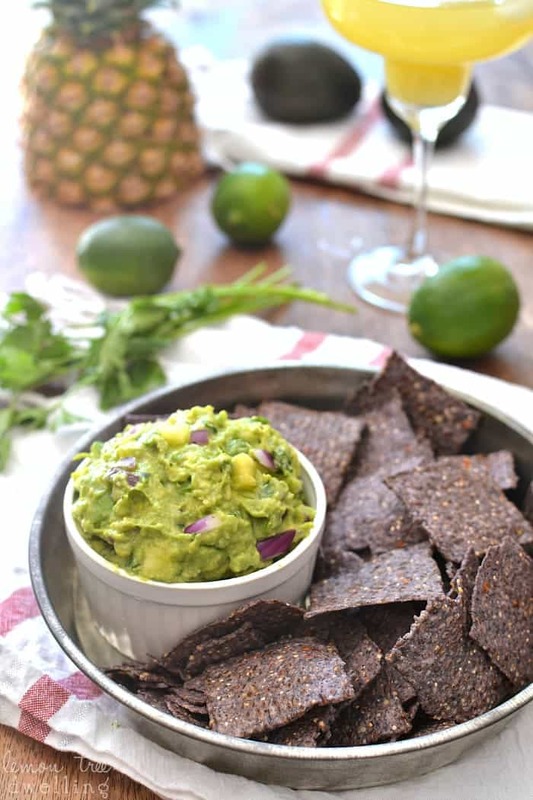 I can’t resist a bowl of guacamole, and I love the idea of adding pineapple! So good!! I am such a sucker for guacamole, Cathy! But this pineapple version sounds absolutely amazing! i think I would devour the entire batch in one sitting! I will take margaritas in any form…they are my weakness! And we are totally on the same wave length…pineapple guac is da bomb! Oh my gosh Cathy – this dip looks amazing! 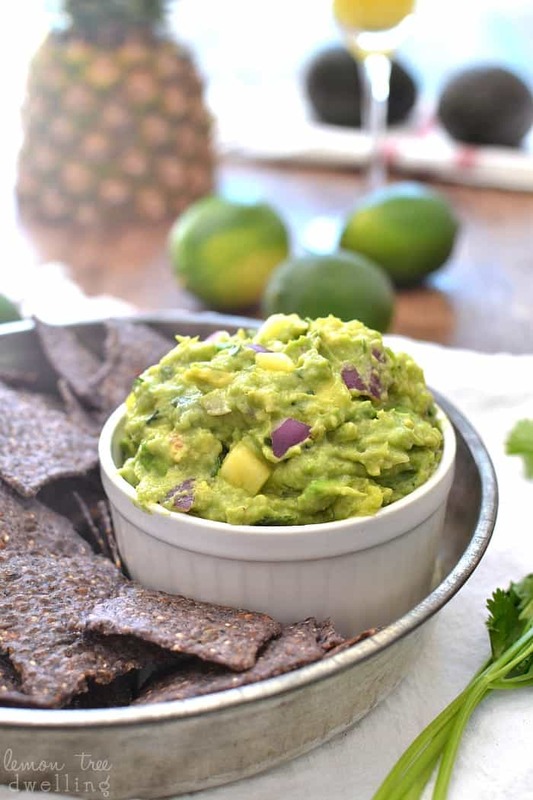 Seriously, I could live on guacamole … and Mexican food in general! 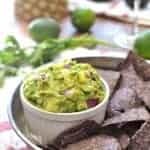 I have never had pineapple in guacamole and I can’t wait to try it!